Thank you Nancy Shohet West for including ClutterClarity in this wonderful article about another innovative way Americans are coming together to share our abundance. Stopping by the library? No need to limit yourself to books and a DVD or two. While you’re there, consider whether you have any short-term use for a novelty cake pan, a jigsaw puzzle, a food dehydrator, a label maker, a trowel, a guitar, or a telescope. Books remain at the crux of any public library’s collection, but such institutions are starting to think far outside the box when it comes to patrons’ needs, as demonstrated when the Boston Public Library earlier this month launched an initiative to lend out mobile WiFi hotspots, portable devices that provide Internet access by tracking signals from cell towers. According to Kristi Chadwick of the Massachusetts Library System, a state-supported collaborative that provides services to libraries throughout the state, the concept began decades ago with art prints. “But what it has evolved into is finding ways for libraries to support their communities in ways they did not traditionally do by looking at the needs of the community in areas beyond literacy,” she said. 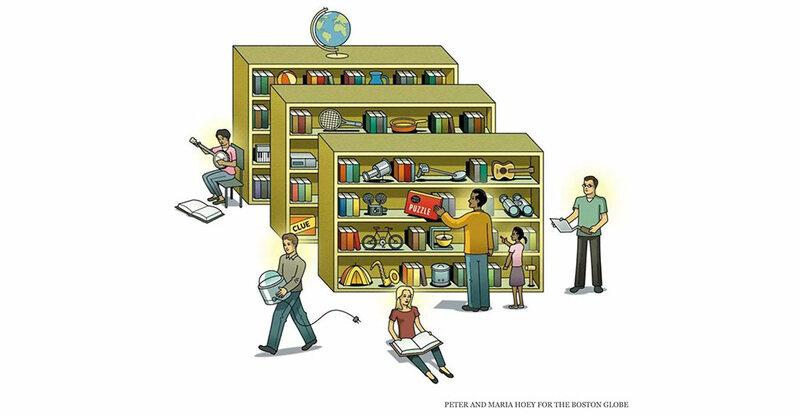 As many area librarians who oversee Library of Things collections see it, the items essentially fall into two broad categories: items that will be used only rarely, such as a novelty cake pan or a label maker; or try-before-you-buy items that a prospective consumer might want to test-drive before purchasing, such as a video camera or a musical instrument.